Greetings to all. We miss you and love you. Our last post updated you on how our first few weeks had been, since our return. As we have continued to settle back to life here, we have also taken some time to see how our belongings have held up over our time back in the United States. We recently took our truck into the mechanic so that they could perform their 80,000 km service. As they serviced the truck, they found a few costly long-term problems with it. We opted to not make those repairs at the moment, so that we could patiently pray and consider all our options. One of our major reasons to no jump into repairing the truck is because we have been thinking about changing to a more family appropriate vehicle and switching to an automatic transmission so that Rocio could feel more comfortable driving here on her own. We are now considering to sell or trade in the truck and purchase an automatic SUV. We are looking into different options, but with each option there definitely seems to be some additional cost involved in order to make this change happen. Many of you often ask how you could help and what specific needs we might have. For that reason, we decided to share this information with you all. We trust the Lord to provide the right vehicle and the finances for it in His perfect timing. If you feel led to give toward this specific financial need, you can still do so through Living Hope, our financial hub, and make a note indicating it is for the “vehicle”. If you have any specific questions or would like to talk to us regarding this, please don’t hesitate to contact us. We would be happy to chat with you! Above all, please continue to pray for us that we may have wisdom from above in all of our decision making. Warm greetings (literally!) from Nicaragua! It is hard to believe that we have been back here for a month now! It has been a busy few weeks, settling in, adjusting and getting back into the swing of things once again. There have been moments of joy, moments of frustration among many other emotions. Through it all, God has been so good to us and as always, continues to be with us as we move through this transition. We have some very exciting news to share with you all! Within 24 hours of us arriving to Nicaragua, we received news that our residency had been granted! Talk about impeccable timing and God’s favor and grace upon us! After several days spent at immigration, we finally received our Nicaraguan ID’s and were granted a one year residency. Wohoo!!! Thank you to all who have prayed with us regarding this. We now have to go through the process with Eliana, since she is new to our family. We will be submitting all of her documents in the next week, so please pray that things go smoothly for her. Mike has been busy getting some projects done at CC Managua and at our home. One exciting project he has been working on is installing a new sound system at the church. He’s learning a lot about sound and then teaching a few guys at the church so they can learn as well. He’s also meeting with the worship team and pouring into them as well as working together with them as they all seek to grow in their talents and skills. Rocio has been working on organizing the house and trying to establish some routines with the kids. She’s also praying about some ministry opportunities at church. Nate and Eliana are doing well. Nate loves being back in Nicaragua and has enjoyed getting to know all of the children in the neighborhood. The highlight of his day is getting to play outside with all of his friends. He has also started playing soccer, and so far, he is loving that. We are praying for what direction to take regarding Nate’s education this coming fall as he begins kindergarten (homeschool or traditional school). We appreciate your prayers for that as well. Eliana, who just turned 6 months, is still adjusting to the drastic weather change. She doesn’t really enjoy being sweaty! 🙂 Other than that, she is doing well. Have you ever felt out of place? It’s not the most comfortable feeling, is it? During the past months, our family has walked through some of these feelings—having left our home in Nicaragua unexpectedly back in April of 2018, experiencing some difficult changes while here in the states, and now getting ready to return to Nicaragua. It has certainly been a time where we’ve often questioned, “Where is home?” In the beginning of this year, as I wrestled with that question, the Lord brought me to the well-known verse above, Philippians 3:20. For what this season of life has been, it has given such a fresh and encouraging perspective. It’s a reminder that we desperately needed: our permanent “home” is not found in any specific location here on earth, our home is in heaven. We are pilgrims through life here on earth, but our permanent residency is above, and we EAGERLY anticipate being in our eternal home with our Savior. As we wait for that day, regardless of where we are living (Nicaragua, California, ect…), we want to faithfully be doing what He has called us to do. We wanted to take a moment to thank each of you who have prayed with and for us and our family during this season. A lot of change has taken place in these past 10 months. There have been changes in Nicaragua, changes in our family, and changes in our own hearts. Some changes have been difficult and others a beautiful blessing. Through it all, we know God has sustained us, walked with us and shown His faithfulness time and time again. We will be making our way back to Nicaragua at the end of this month. Once again, we ask that you join in praying for our family as we return and settle back into life there. We are looking forward to sharing the love of Christ with those who are hurting and in need. Please pray that we would be attentive to God’s leading and all that He would want to do as we serve Him and these people whom He loves dearly. Our contact and donation information can be found on the tabs listed above labeled: “Where to Give” or “Contact Information.” We would love to hear from you! Recently, in our kids Sunday evening study, we covered Mark 10:13-16, where the little children were brought to Jesus. This passage is always a great reminder of how special kids are to our Savior. Jesus is “greatly displeased” when the disciples “rebuked those who brought” the children to Him. He tells his disciples, “Let the little children come to Me, and DO NOT FORBID them; for of such is the kingdom of God” (emphasis mine). Working with children can be tiresome and even challenging…but never a waste of time. Jesus took time to minister to them and invest in their lives. So, it is a joy that we have been able to do that often, and even more so in the last two weeks. Last week, we had the opportunity to take the 5 hour drive along the country side to the small town of Nueva Guinea. Over the last 6 months, we have been blessed in getting to know the missionaries who serve at the Calvary there, and they have become dear friends. We were able to come alongside them and the church body to do a two day VBS-type outreach for the children of the church and the community. Our time there was fun, rich and a great blessing. We got to spend those days with about 40 kiddos each day. Our time with them consisted of Bible lessons, music, crafts, games and a lot of hugs & laughs. Would you pray that the Bible truths, songs and love poured into each of their little hearts would produce lasting fruit? Many of them come from very rough backgrounds (which is the sad reality for many children of Nicaragua in general), so our desire is to bring the hope of Jesus into their lives, in the midst of the difficulties and hurt many of them face. This week, we had the privilege of having a team of parents and their teenage children from Christ Journey church in Florida minister to our kids, here in Managua. They too did a VBS-type outreach with the kids from our Sunday evening study and an additional small group of students from the school (Club Cristiano La Esperanza). The kick off took place on Sunday evening, where they shared with the kids about Palm Sunday. Then, the Easter story was continued the following morning, along with songs, crafts and games. On Tuesday, we culminated our time with the kids by getting on a bus and driving out to Ruby Ranch, which is about an hour outside of Managua in the country. At Ruby Ranch, we had a fun day full of games, water slide, horses, bikes, and so much more. We are so grateful for the team of Christ Journey Church who poured the love of Jesus into the lives of the kids we’ve been ministering to for the last 9 months. Not only did the children have a blast, but they tangibly experienced the love of Christ. Please pray for these kiddos as well; That God would do a deep and life-changing work in their lives…so they would in turn make an eternal impact in their families, communities and country. We hope you have a wonderful Easter, celebrating our risen Savior! He has conquered and our lives have been eternally changed. That is worth celebrating! If you or your church are interested in coming down to Nicaragua, please feel free to contact us. Summer is approaching quickly and now is the time to begin planning! Blessings to you all and as always, THANK YOU for praying and reading. On Monday, March 12, we set out at dawn to make our way to Bluefields Nicaragua by motorcycle. We finally arrived at our destination by 4:30pm, after a long journey across the beautiful country of Nicaragua. Bluefields is a coastal city, which is known for fishing. The people of this region speak Creole, which is an English based language, so it makes it made it easy for us to communicate. The initial plans for the trip were for us (Brinson Buzbee, Greg Brakensiek and I) to join a medical team as they made an exploratory missions trip up the river and visit some of the communities in the region of Pearl Lagoon. When we arrived to Bluefields, we were told that the plans had changed. The medical team was no longer coming and that this was now “our” missions trip. Although the medical team was no longer coming, our plans didn’t really change much. We had always planned on going into the communities to share the Gospel, teach the Word and pray for others. But now, the time and focus of the trip was going to solely be focused on doing this. God’s plans are always greater. On Tuesday, the 13th, we set sail and made our way up the river with the end goal of making it to the community of “La Fe” by the afternoon. On our way, we stopped by Haulover where we were able to say hello to a dear friend named Margarita. We had a sweet time of prayer and then made it to La Fe early that afternoon. What happened at La Fe was such a God-ordained time. Within moments of arriving in this little town, we were sharing the gospel and praying with people. I talked to an older gentleman and mentioned our passion to share God’s Word and that we would love to do this in the community. He said, “If you invite people, they will come.” So we did just that. For the remainder of the afternoon we spent time getting to know the community. We visited homes, continued praying for and ministering to the families and children that followed us around. As we made our way through the community, we met Pastor Alan, a local pastor. Pastor Alan pastors a church in this little town called “GoKing,” which means “God’s Kingdom Come.” He is a very sweet and hardworking man. I asked him what were some of the major needs for him and the community, and his response blew me away. He said that himself and the other pastors in the surrounding communities have no one to train them and pour into them. They do the best they can to pastor, but they do not know how to do it. Immediately, my heart was stirred. He also mentioned that there was a need for a Christian drug and alcohol rehabilitation ministry, and that La Fe would be an ideal place to set one up because it is the only community in the region that does not sell alcohol. Would you join us in praying for Pastor Alan and the pastors in that region? That evening, at 7:00pm the people we had invited to come out to the center of town showed up with their chairs and began to sit around. Within moments, a worship service had begun! We sang some songs that were familiar to us and then they sang songs that they knew. It was such a beautiful scene. One of the locals that went with us on the boat shared with the group about what it means to sincerely follow Christ. After, I got to share on Romans 13:11-14 and Ephesians 6:10-17. Included in the message of encouragement and exhortation, I also shared the gospel. At the end, I gave an altar call. At first, they were very timid, but eventually one lady raised her hand to pray to receive Jesus. Then, many others followed her example. That time was like nothing I’ve ever experience before. The next morning, Greg and I decided to go spend time with Pastor Alan. We were able to meet with him a few times throughout the day. We spent some time ministering to him and we got to take him through the Inductive Bible Study method. It was neat to sit with Pastor Alan, open up the word and study it together. On Thursday, we made our way back down the river and stopped by another community called “Kukra Hill.” There we passed out some gospel tracks and shared with people. We got to share the gospel with Danny, a motorcycle mechanic. After some time talking with him, Danny prayed to receive Jesus. Praise the Lord. Thursday evening, we made it back to Bluefields and early on Friday, we made our way back to Managua. We thank the Lord for his protection and for His perfect plans. Truly, this trip was incredible and we will continue praying to see what the Lord has in the future. We know He loves these people, sees their needs and is already at work in this beautiful region. Thank you so much for praying and please continue to do so. God is faithful. Greetings everyone! We hope the beginning of 2018 has been pleasant for you. A month ago, we returned home from our visit to California. Our time there was rich, full and FAST! We thank the Lord for allowing us to see so many of you and for the time we got to spend with family. We were so blessed! A few weeks ago, we had the opportunity to serve at “A Night to Shine” event that took place for the first time here in Nicaragua. If you are unfamiliar with a Night to Shine, it is an event funded by the Tim Tebow Foundation for children with disabilities. It is a night where they get to go down the red carpet, enjoy a meal and have some fun. Most importantly, it is a night where they are loved on and are reminded that they are “fearfully and wonderfully made” (Psalm 139:14). We had a great time loving on these precious kids. As we approach March, we wanted to share some things we are praying through and planning to do as the Lord leads. We want the Lord to be the One who directs each step and so we ask that you join us in praying for that. First of all, Mike is praying about possibly going on a mission trip to an area of Nicaragua, called Bluefields. Him, along with a friend and a missionary from CC Nueva Guinea will travel to Bluefields and then take a boat up an inter-coastal route, through a series of bays and canals to get to the region of Pearl Lagoon. The purpose of this trip is to see what ministry opportunities are available to share Jesus with the communities located along those areas. Next, we are planning on going to visit our friends of CC Nueva Guinea and doing a small children’s outreach while we are there. It will be a two day VBS-type of event for the children of the church and the community. We appreciate your prayers as we prepare for this exciting outreach. We are really excited for April! Not so much about the weather, since it is the HOTTEST month of the year…but we do look forward to receiving our firsts guests of the year. We have our friends, Pastor Daniel and Matthew Chavez coming in the beginning of April, as well as our friend, Pastor Mike Sternad (Mobile, Alabama). We anticipate for what the Lord will do during their time in Nicaragua. During their visit, we will be doing a men’s fellowship night at CC Managua. Please pray the the Lord would draw the men out and that they would be encouraged by His Word and the fellowship that takes place that evening. Once again, thank you to all who read, pray and give. We love and appreciate each one of you. Hello! We hope you all had a joy-filled Christmas in company of family and friends. It has been so sweet to be reunited with family and enjoy this holiday season with our loved ones. We are cherishing every moment and are so thankful that we were given this opportunity. With all the busyness of ministry, traveling and holidays, it has been challenging to sit down and write an update. The weeks prior to our California visit were rich and full, and we thought you’d like to hear about a couple of those things that took place. The month of December started off with a mini VBS at Club Esperanza. The school year ends at the beginning of December so it was a perfect time to minister to the kids as they begin their summer break. We had an incredible time singing, dancing, doing crafts and most importantly, learning about God’s unending love. Our theme verse for the week was Romans 5:8, “But God demonstrates His own love toward us, in that while we were still sinners, Christ died for us.” The kids (and adults!) had a blast and we are so delighted and humbled by the opportunity we have been given to love on these little ones. We look forward to doing a bigger scale VBS in the community and sharing Jesus with as many children as possible. We celebrated our Savior’s birth at Calvary Managua with a women’s Christmas tea. We had a special time reflecting upon our Savior and learning more about who He is: Wonderful, Counselor, Mighty God, Everlasting Father, Prince of Peace (Isaiah 9:6). Our evening together also included worship, delicious food, games and sweet fellowship. It was a blessing to gather together as women and begin the Christmas season with the correct perspective. It’s hard to believe that the year has come to an end. It was a big year for our family and as we reflect on all that has taken place in 2017, all we can say is God has been faithful. We have seen Him work in incredible ways and His loving hand upon our lives has been so evident. We look forward to 2018, knowing that He is in control and has every detail prepared. We thank each and every one of you for your continued prayers, support and encouragement during these past 9 months (the time we have been in Nicaragua). As we step into this new year, we look to the Lord for guidance and continued direction for ministry. We appreciate and thank you for praying along with us. We wish you and your family a wonderful, blessed and fruitful 2018. Hello friends!!! We haven’t posted an update for a while, so this is long overdue. We have had a busy season and are excited to share some of the things that have been happening here in Nicaragua. First of all, can you believe that we have been here for HALF A YEAR already?!? Sometimes it seems like we have been here forever, and other times it seems like time has flown by! Looking back on these six months, we rejoice in seeing God’s faithfulness in every detail of our lives. He has sustained us through the challenging times and He has blessed us in ways we never imagined. Our heavenly Father has been so good to us!!! These last few weeks (and last few months) have been full in various ways. We’ve had some “not-so-fun” things to deal with like: flooring problems, plumbing issues and visa renewal challenges. We are grateful that all of those have been resolved for now. We reached out to many of you for your prayers regarding our visa renewal. In our first attempt to renew, we were denied. They asked that we bring more documents, which we were able to gather and return the next day. Praise God we were granted another 3 months, so we are good to go until December! Thank you for praying through that with us. Since our next renewal is in December, we are praying about visiting California for Christmas and the holidays. Now, onto the more exciting stuff! Pastor Cal from CC Managua and Mike got to go and visit Calvary Chapel Matagalpa a few weeks back. They spent the day with Pastor Josue and his family and got to see some of the ministry that is taking place in Matagalpa. Below are some pictures from their day at CC Matagalpa. We recently hosted our first women’s fellowship night at Club Esperanza. We had over 40 ladies come out that night and Rocio got to share a message on Mark 4:35-41, which is a passage of Scripture that the Lord has used to encourage Rocio many times in the last year. It was a blessed night, and we look forward to seeing how we can continue to build relationships with the people of Via Guadalupe and impart Christ’s love for them . Please join us in praying for this community. Just this week, we were blessed with a visit from the mission’s pastor of Revival Christian Fellowship (Menifee, California). Mike, Rob (Mike’s dad) and Pastor Cisco started off their trip by visiting the missionaries and church body out in CC Nueva Guinea (6 hours from Managua). They enjoyed seeing all that the Lord is doing there and were blessed with wonderful fellowship. Please pray for the missionaries (Greg, Angela and Lucy) and Pastor Carlos, who are faithfully serving Jesus and the people of Nueva Guinea. Once the guys returned to Managua, we hit the ground running and got to serve in various ways. We had an opportunity to do an emergency training class with the teachers and staff of Club Esperanza. Pastor Cisco, who has emergency medical training, was able to equip the teachers with some basic training that enables them to better respond in case of an emergency. Not only did they learn about being first responders but they also heard about Jesus and His heart to help those in need. The staff was so grateful to have this instruction time because it is something they had been wanting for a while. The staff at Club Esperanza, learning how to respond in emergencies. Pastor Cisco also taught at CC Managua and at our Sunday evening Bible Study in Via Guadalupe. It was an encouraging message reminding us about the heart of being a servant, based on John 13. As always, we are so encouraged, blessed and thankful for your prayers! Please continue to pray for the beautiful country of Nicaragua. Pray that we would continually hear and be obedient to do all that the Lord would want us to do here in Nicaragua…and most importantly, that many would know Jesus. Thank you for reading! We send you our love from Nica! The Lord has done and continues to do great things for His children. It is such a privilege that we get to serve our great God! We continue to see and be amazed by God’s faithfulness toward us as we serve Him here in Nica. The month of July flew by! We had our first visitors come this month. It was so nice, so encouraging and so fun to have friends here for a week. 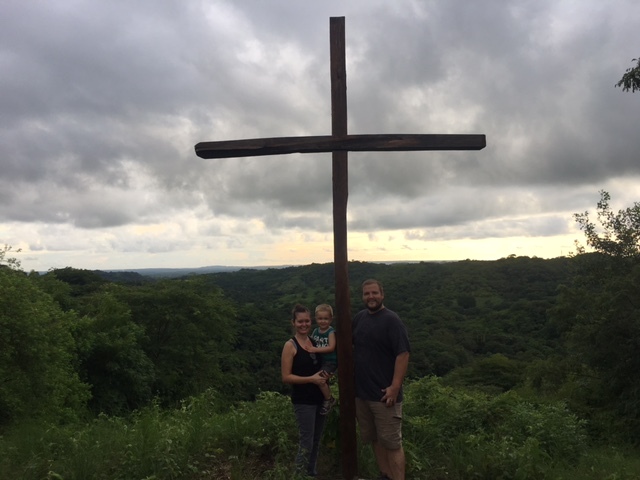 We got to explore a little bit of Nicaragua with them and they got to do some of our weekly ministry activities with us. We are so thankful for their time here with us! Our friends Barbs, Ana and Siera visiting us from California. We have a testimony to share with you from our Sunday afternoon Bible study. A young guy named Isaac has been attending the study regularly. Mike initially met him while walking in the neighborhood with a missions team. He (Isaac) approached the team because he has an interest in practicing English…so, seeing a bunch of North Americans seemed like a great opportunity to do just that. But God had greater plans than just practicing English. Mike told him about the Bible study and he actually showed up! As they studied the book of Mark, the topic of repentance came up. After the study, Isaac shared with Mike that he wasn’t ready to repent yet. He wanted to “fix” his life before coming back to the Lord (he used to go to church some time ago). Mike explained to him that we do not need to “fix” our lives before coming to the Lord and continued to minister God’s truth about salvation and repentance over the next few weeks. A few Sundays ago, Isaac did not show up. His mom told us that he had been beaten and robbed. The next time we saw Isaac, he talked to Mike for a while and shared with him that God had used this incident to shake him up and to make him realize that what he had been learning was true: he didn’t need to wait any longer to get right with God. God’s Word does not return void! This young man recommitted his life to the Lord and we are so excited to see what the Lord will do in and through Isaac!!! If you think of it, pray for him and his renewed faith and hope in Jesus. Los niños from our Sunday afternoon study. Los adultos from Sunday afternoons. Mike has also been sharing a weekly devotional with the students and staff at Club Esperanza the last few weeks. It has been a great opportunity to share God’s Word and His love to these precious people. We’ll wrap it up with that. Thank you for reading and thank you for praying! Enjoy the remainder of your summer friends. WE LOVE YOU! Can you believe we are already in the month of June?!? Hope you are all enjoying the beginning of your summer. And for all of you 2017 graduates, congratulations!!! We have also started a few Bible studies in the last few weeks, which is something we have been praying about for a while. The first Bible study is for youth kids whose parents are missionaries here in Nicaragua. Here is a picture of our first time with them. We had games, worship, snacks and a study in God’s Word. Please join us in praying for this group of youth. It is exciting for us to share with you that we have also begun a Sunday afternoon Bible study for adults and children at the school site (Club Esperanza). We have been given the freedom to use the building on Sunday afternoons so that we can share God’s Word with people all of ages. In preparation, we purchased some Bibles for the adults to use and some crayons for the kids. Our first study took place last Sunday. We had two ladies and 8 children show up. We are at rest knowing that God will do what He wants to do through this. For now, the adults will be going through the Gospel of Mark and the kids will be studying the life of Jesus by going through the gospels. Here are a few pictures of us setting up and of the children coloring after listening to their Bible lesson. In other news, Mike has been enjoying leading worship on Sunday mornings and Wednesdays at Calvary Chapel Managua. He also got to teach on a Wednesday evening service. It has been a blessing getting to know Pastor Cal and his wife Jessica. Continue to pray for the work the Lord is doing through CCM. First of all, THANK YOU all for your prayers and encouragement. We love to get emails, texts and phone calls from you all. We are incredibly blessed. 1-Please continue to pray for the Eleazar, Belen, Shaylyn & Mario (kids who lost their parents) and their grandma Maribel. They continue to adjust and adapt to the new normal. Mike was able to visit them today and bring some food that was donated. 2-VISA RENEWAL: Our visa expires in a few weeks (it has to be renewed every 3 months). For that reason, the three of us will be traveling to Costa Rica for a few days in order to renew our visa. Please pray that things would not be too complicated and for protection and provision as we take this little trip. 3-Pray for the communities we are reaching out to (Via Guadalupe & surrounding areas). Pray that their hearts would be receptive to the gospel and that the Lord would use this little Bible study to bring many into His Kingdom. We are blessed with the opportunity to serve Jesus in Nicaragua. We appreciate your prayers.